A suspected gang of thieves yesterday broke into a house in Bulawayo's Makokoba suburb and got away with a three-year- old girl and a handbag containing two mobile phones. The child was found three hours later loitering in the street. 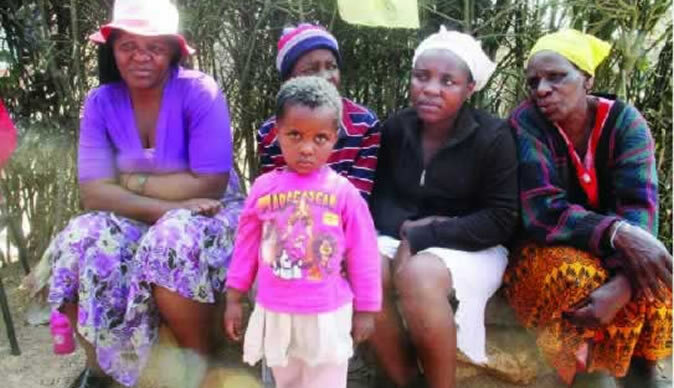 It is understood that the child was asleep with her grandmother, Mrs Flora Dube, at House Number 147 along 10th Street, when the gang allegedly broke in. The news crew visited the family at about 9.45am and found the child in its mother, Miss Gugulethu Dube's arms while a group of neighbours were discussing the issue. Narrating the ordeal the grandmother, Mrs Dube, said she was shocked when she woke up at about 3am and found the child missing. 'I was asleep with my granddaughter Lerato. Surprisingly she woke me up at about 3am saying she no longer wanted to sleep. We slept again and after a few minutes I woke up and found her missing,' said the visibly shocked Mrs Dube. She said she searched for the child all over the house but could not find her. Gugulethu said the thieves gained entry through a window since all the doors were locked. 'We do not know how they opened the window because all doors were closed. I do not understand how they did it because my mother did not feel anything when they took the baby,' she said. At that moment scores of neighbours mobbed the news crew as they jostled to tell their own story. 'We are shocked by what happened here. Surely how can someone steal a three-year-old child? We ran all over the place up to Mazai River looking for this child but we could not locate her,' said one woman. The neighbours said the child was discovered three hours later along the same street. They said they suspected that she was hidden in one of the houses in the neighbourhood. 'After searching for about three hours we came back to this street and found the child in the middle of the road along this street. She was warm, an indication that she was hidden in one of the houses,' said another woman. Another woman said the moment they heard that the child had disappeared they started praying while others went to the Mzilikazi Police Station to report the matter. Contacted for comment Bulawayo deputy provincial police spokesperson Assistant Inspector Bekimpilo Ndlovu confirmed the incident. 'We are investigating a case where a three-year-old infant was allegedly kidnapped in a suspected break-in. We have not made any arrests so far,' said Asst Insp Ndlovu.